Why Do Detailed Landfill Designs for Landfills? It has been suggested that to spend money on designing a landfill when you could just find a hole in the ground and throw rubbish into it, until it is full would save time and money. It is only garbage anyway isn’t it? In fact, if society did that the health of the nations would soon (within 20 to 30 years) be placed in jeopardy with little or no drinkable water, and houses in danger of explosions if built near almost any landfill. Why is Municipal Waste so Big a Danger to Us All? Municipal Solid Waste (MSW), more often known as trash or garbage, comprises the everyday items people use and then throw away. It includes newspapers, furniture, clothing, bottles, food scraps, grass clippings, and product packaging. In 2010, Americans generated about 250 million tons of MSW. In the United States, landfills are regulated by the Environmental Protection Agency (EPA) and the state’s environmental agency. Municipal solid waste landfills (MSWLF) must be designed to protect the environment from contaminants which may be present in the solid waste stream. 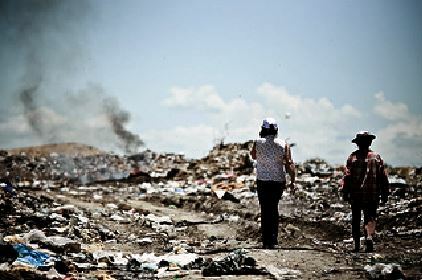 Disposal of waste in a landfill involves burying the waste, and this remains a common practice in most countries, but municipal waste is polluting and due to settlement and other problems it is also frequently unstable. Landfills were often placed in abandoned or unused quarries, mining voids or borrow pits. A properly designed and well-managed landfill can be a sanitary and relatively inexpensive method of disposing of waste materials. Older, poorly designed or poorly managed landfills can create a number of adverse environmental impacts such as wind-blown litter, attraction of vermin, and generation of liquid leachate. Another common product of landfills is gas (mostly composed of methane and carbon dioxide), which is produced as organic waste breaks down anaerobically. This gas can create odor problems, kill surface vegetation, and is a greenhouse gas and it is important to ensure future landfills are done without these effects, and that past mistakes never happen again. Detailed Landfill Designs must be prepared by law and approved before work starts. They are required to comply with environmental design issues like maintaining minimum slopes. Surcharging where is is practiced also has critical implications for landfill design and safe long term management. Further settlement will happen when further loading is applied and this has additionally been shown to cause significant rises in leachate levels in the waste. which can have severe stability implications. Forecasting the potential rise in leachate levels is obviously a crucial part of leachate management. Planning for vertical extension ( surcharging ) of existing waste masses is also significantly helped by accurate survey information on settlements of a variety of wastes due to self-weight, continuing decomposition, and any increased loading. Why is Landfill Settlement Prediction Important? Forecasting the settlement on landfill sites has changed into an imperative component of safe landfill design, void planning and long term management. Pragmatic prophecies depend heavily on correct models of engineering behavior, especially the long term settlement characteristics. Serious volume reduction and therefore settlement will happen through decomposition of the biodegradable part, and the physical processes related to self-weight. The major design requirement which militates against rapid attainment of FSQ is the philosophy in landfill design of preventing or reducing infiltration of water. The lack of flushing with water which this produces directly delays the progression to FSQ. Landfill design engineers must always take care to design all landfills to avoid landfill gas hazards, and if they do not life can be jeopardized when landfill gas gets into houses. Landfill leachate is generated from liquids existing in the waste as it enters a landfill or from rainwater that passes through the waste within the facility. The leachate consists of different organic and inorganic compounds that may be either dissolved or suspended. An important part of maintaining a landfill is managing the leachate through proper treatment methods designed to prevent pollution into surrounding ground and surface waters. Based on recent EPA studies, a liner and leachate collection system constructed to current standards typically has a liquid removal efficiency of 99 to 100 percent and frequently exceeds 99.99 percent. In the developed nations formal regulation has been enacted requiring detailed record keeping for landfills, but has rarely been in place for more than 30 years. The question arises increasingly these days during the detailed design stage of a landfill project about when it will be, when the first properly designed early landfills that were licensed can be left and no longer expensively monitored and maintained. There are a rising number of completed landfills where the owners still have to comply with their licence conditions, but they are becoming a lot cleaner and the material in them is at times considered to be reasonably inert and harmless. Unfortunately, detailed landfill design helps very little in knowing how long these landfills will remain as a liability and have to be constantly monitored and maintained. By requiring landfill developers and operators to submit a detailed landfill design the developed nations ensure that landfills are built in accordance with minimum standards to prevent them being a danger to the local environment and to the people living near them. Despite the inability of the detailed landfill design to set a duration for the period before the landfill will be considered to be reasonably inert and harmless it is still essential to carry out a detailed landfill design for each landfill before infilling starts. The overall approach to design, and the design of each element of the landfill appropriate to its environmental setting, is determined through an initial detailed landfill design risk assessment. The risk assessment approach is carried out to an agreed standard methodology. If the risk assessment indicates that the chosen site is suitable for the landfill proposed then the design can commence (as long as Health and Safety and ATEX etc compliance requirements are met), and no major hazard to the environment is then likely to occur.